State of Origin | Frank & Donnis Travel Blog "the more we see the more there is to see"
So begins our first full week at home. By now we thought the jet lag would have worn off. We still seem to be getting sleepy (and hungry) at odd hours. Our sleep pattern has changed and we are waking at silly early morning hours. I must also mention what a joy it has been to drive our new Hyundai i30. We have just discovered we can load music from our iPad into the car radio. Now we can have music wherever we go when away from radio signals without the need to carry a CD or music on a USB stick. During our first drive through the Rockies using Alecia’s car we were spoiled with Satellite Radio,Station XM 31, The Coffee House Acoustic Singers /Songwriters Station. http://www.siriusxm.com/thecoffeehouse This station gave us delightful music all through the Rockies where normal stations just cannot be tuned in. We already have our own acoustic collection so it makes sense to transfer it to the car radio. *Yes I am still a little sad RALLYE has gone but i30 is doing a good job of replacing it. 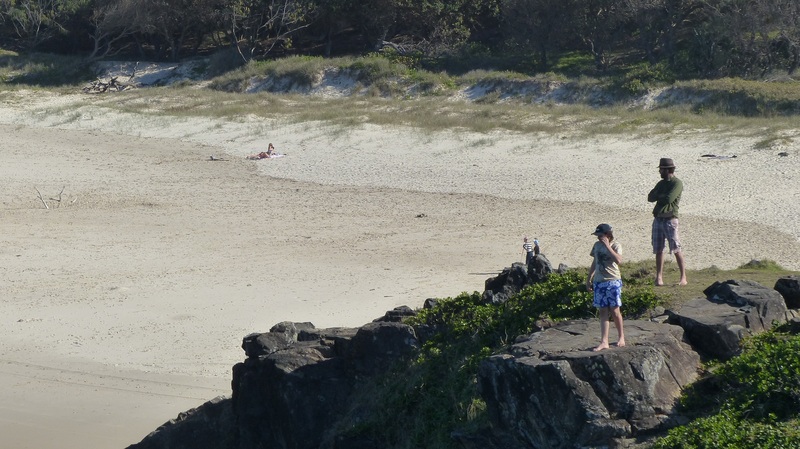 We packed a picnic lunch and a couple of cold beers and drove to Cabarita Beach in northern NSW. 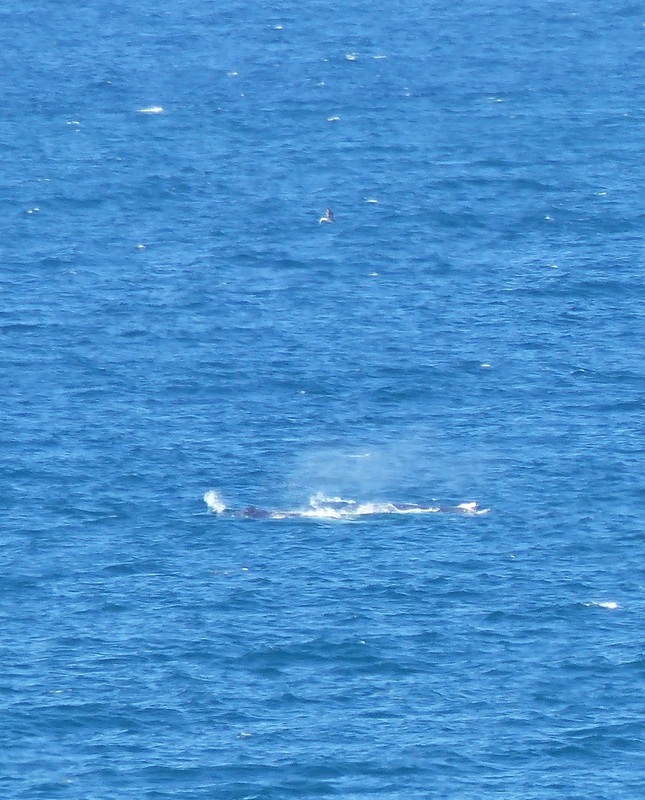 Another cliff below Cabarita Whale viewing headland. I have been to this beach before, it is very pretty and has a high headland suitable for whale watching in the season. Tis the season now! We cllmbed the timber staircase to the top of the high cliffs and found a dozen or so people on the viewing platform going ooh and aah to the distant sightings. Distant! Yep. Even on 48 times zoom the Lumix FZ200 can only show limited detail. From the photos it seems a pod was heading north. Whales in their annual migration from Antartica to tropical waters. 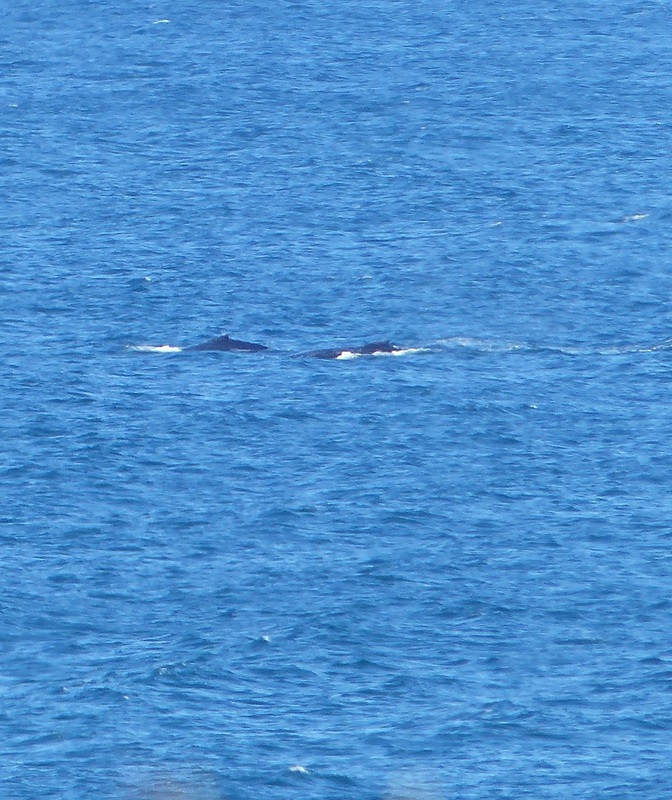 More whales in a pod. We then travelled a little further south to Hastings Point and enjoyed a little splash in the ocean. Well, at least Donnis rolled up her jeans and splashed up to calf level. Although the sun was shining and warm, there was a cold wind blowing off the water. No way was I going to shed shoes, socks and roll up my trousers. Then we returned via Cabarita and stopped to buy a piece of fish to share on our way home. Indulge me for a few moments as I explain what happened. The sign on the wall read “ fish of the day” $8 and “fish and chips” $7.50”. Hmmm! That’s a strange price. Now let me back up a little here. I do not eat the , imported fish from Vietnam known as Basa. I asked the lady behind the counter what the fish of the day was. Basa, came her reply. I asked if she had any real, local caught Australian fish and what fish was “fish and chips”. Her answer was so quiet I had to ask her to repeat the reply. She said, “we only have Basa”. That’s right, Fish n Chips and fish of the day and all the other options proudly displayed are…Basa . I thanked her and left the shop. The feeding of the farmed Basa in Vietnam is by questionable bottom trawl side catch, ground into a powder, cooked, pelleted and fed to the ugly catfish living in sewerage infected waters of the Mekong. Basa?? Thanks, but no thanks, we have plenty of good local quality wild fish right here. Why we need to import questionable fish is beyond me. No wonder our local seafood industry is struggling. Tonight Greg B, a family friend arrived for a few nights. He is moving to Melbourne at the end of the week. Nothing much of importance happened today, except…OMG…I was so excited…Finally, after two months Google search and reading my Lumix FZ200 user manual over and over I finally found how to format the SD memory card in the camera. The format instructions are tucked away in the manual in a place I would not have thought to look and did not, look. Even after successfully formatting the SD card I doubt I can remember how to do it again without consulting the user manual in frustration again. Just before Donnis left for Canada in March this year, the large vacant block of land next door with creek side frontage was being prepared for building several high rise apartments. 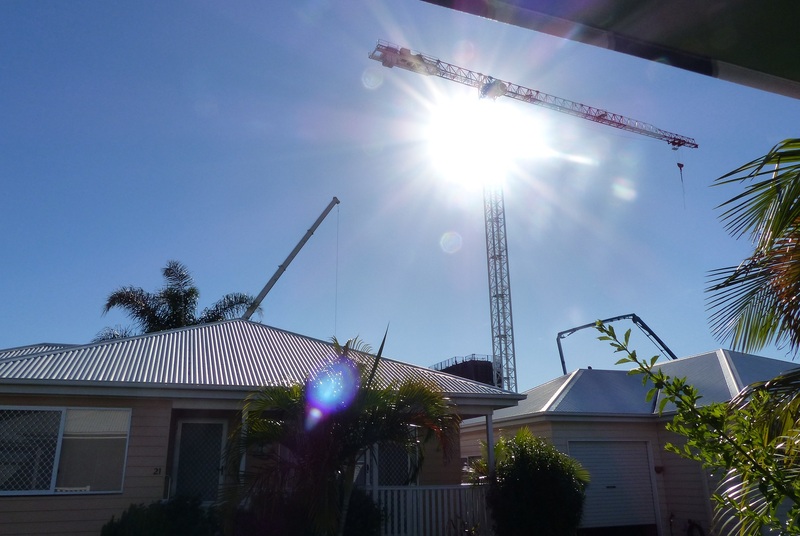 Now there are two cranes and a small army of workers on the first and most exclusive of the apartments. This one has the best views and water access. 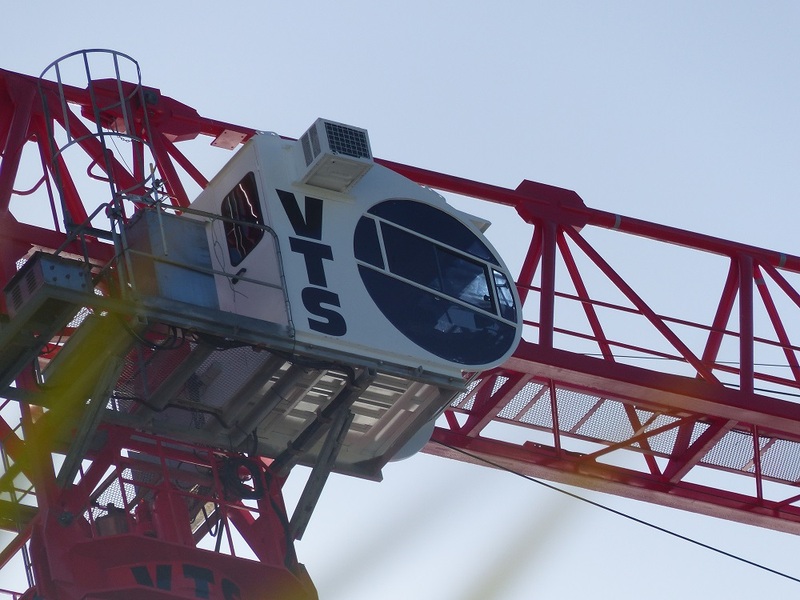 The tallest of the cranes is operated by two men who sit in air conditioned cabins. It takes them 20 minutes to climb the ladder to their work station. Hmmm! Today is open house for “off the plan” sales and a “demo” apartment at Water Point for viewing. Tonight a group of residents went to our clubhouse to watch the final game of the State of Origin. This was an important game as Queensland has won one game and New South Wales has won one game. This is the decider. The venue, Suncorp Stadium, originally named Lang Park when it was completed in 1914 was packed to capacity. In fact it set a seating record. Incidentally Lang Park is considered the best spectator friendly sports stadium in the world. We were in the clubhouse to watch the game on the big screen and to have footy food at half time. Queensland were favourites to win by a small margin. 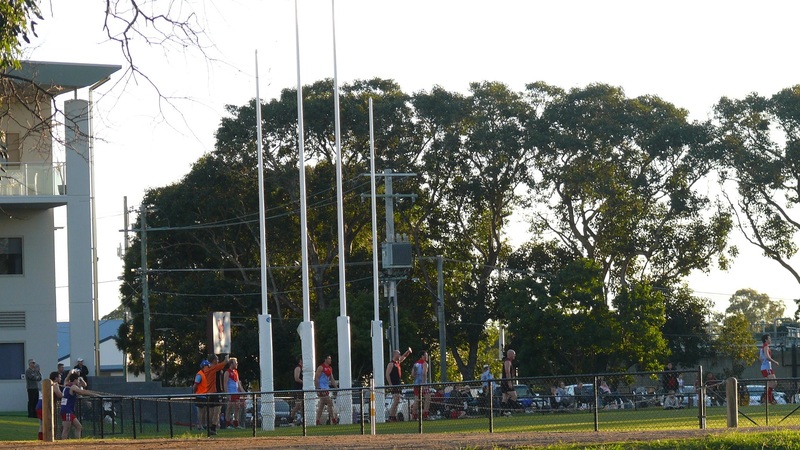 Queensland won, 52 to 6. That’s a bit more than a small margin. Our village Christmas In July lunch was held at Treasure Island Holiday Resort next door. We had 45 residents roll up for an enjoyable meal and fellowship. Christmas in July is a sort of Aussie excuse to get together and have a Christmas style meal at a cold time of year. After all those hot foods in the middle of the day are more suited to the northern hemisphere where Christmas is during winter. Greg B, left today to head towards Melbourne, safe travels Greg. I am almost back into my exercise regime. I have started riding my bicycle but am easing into the Klms. Instead of 20 Klms at 5.30am I am doing 10Klm at 7am. It is simply too dark and cold at 5.30. I am still doing my floor exercises but surfing will have to wait until the weather warms up. We used the hot spa tub, the sauna and relaxed around the pool. Although the pool is solar heated it is still too cold to use. The spa is on the mountain road to Springbrook and has glorious views across the valley to the Gold Coast below. Darn! I forgot the camera. The forecast cold snap and blustery westerly winds arrived this morning. Darn!!! It is winter and snow is falling in the Snowy Mountains and just across the border at places like Tenterfield, Orange and Guyra where we house sat two years ago. We spent the afternoon threading timber slats through our front verandah railings. My my it sure looks good and several people walking by commented on how it changes the look of the front of the house. Over the last 20 or so years on TV, I have watched interviews and training sessions of the Broncos. Now I have seen the clubhouse and training grounds for myself although the primary object of coming here was to see the Retirement Expo. The good thing about the trip was we got to see parts of Brizzy (Brisbane for all those reading this who have never heard of Brizzy) we have not seen before and wondered why we did not bring the camera with us. Hmmm! To say I was underwhelmed is a bit of an understatement. In all there were about 10 stands of people promoting retirement homes and or care centres. There were no options from the other side of the “retirement village” – that is, over 50 resorts or villages – no Government representatives to talk about retirement pensions, no superannuation experts, no medical people, no hearing or dental offerings, no travel agents, no camping and RV representatives. After making an obligatory stop at 9 of the ten stands and collecting brochures, pens and useless nick knacks, we left. Hmmm! Why did we not stop at the tenth desk??? It was more of the same and the sole representative was already talking with a much older than us person. Why wait to talk with somebody about all the same stuff we already knew about anyway. We did fill out of a couple of entry forms to win hampers and free bus trips and overnight stays. The nice carry bags will come in handy for storing stuff and the paper has joined the re-cycling bin while the nifty key ring with a lens cleaner inside will join all the other key rings we have accumulated over the years and now sit in a box in the hope we might use them one day. Every morning about 6.30 I go for a walk (well almost every morning…if it is raining heavily I sissy out). Every day my walk takes me through the park to the Brisbane River where I see the racing skiffs with one, two or four rowers aboard doing their early morning training as the wispy mist rises off the water. The road beside the river has groups of cyclists whirling along on their early morning training. As always I wonder why I have not brought the camera with me. Hmmm! The good camera is too bulky to carry with me on a brisk walk and quite frankly the small camera, although quite handy and with good megapixel count is not in the same league. Besides I am here for the walk. Maybe one day I will get up early and walk to take photos instead of walking for the exercise. Donnis accepted another nursing shift tonight. I dropped her at the Carina Heights Nursing Home and took the opportunity to visit Carindale Shopping Centre. 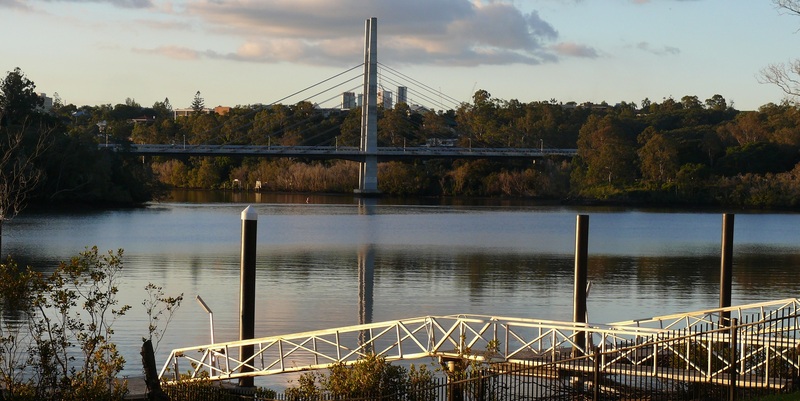 We drove to a suburb called Gaythorne on the north side of the Brisbane River. While trying to interpret and ignore the GPS instructions what should have been a straight forward 20 minute drive turned into a 40 minute lesson in frustration control, traffic and a growing sense of impatience. Despite the GPS trying to send us on a toll road and while I was equally trying to avoid tolls, the GPS won! I suppose all this driving in the city and suburbs we have never heard of let alone visited, is good for our education of the city of Brizzy. My employer for 13 years, Maria D, often told me challenges were “character building”. I guess I got lots of character building Monday and today. Winter is here. Mornings and afternoons are cool. The middle of the day is usually quite nice…provided the sun is shining. There was no sun today and we both wanted to get out of the house and just do a bit of wandering around and window shopping. It is too cool and overcast to polish WWWGO or TERIOS for that matter. It was too cool and overcast to do a river cruise so we went to the Westfield Shopping Centre at Mount Gravatt where Donnis found a dozen bargains in a dress shop. I love my Kindle. I can read it anywhere especially while the CO-PILOT is shopping. Lots of rain and again a cool to cold day. Ummm! Correction. I have been told it IS cold. The CO-PILOT was offered a shift at AR CARE Nursing Home at North Lakes. After dropping her at the facility I wandered around the nearby shopping centre before driving an extra 60 Klms to Kawana Island to visit friends Joan and George at their retirement village. We enjoyed dinner and afterwards they showed photos of their trip to the Northern Territory and Western Australia in July and August 2002. Lilly Creek Lagoon as seen from our campsite. The brooding purple grey mountain in the distance is known as Sleeping Buddha. All the photos of our trip, taken on my trusty oldPanasonic FZ7 digital camera, are stored on floppy discs…YES floppy discs, which are stored in the shed at our home in Airlie Beach. 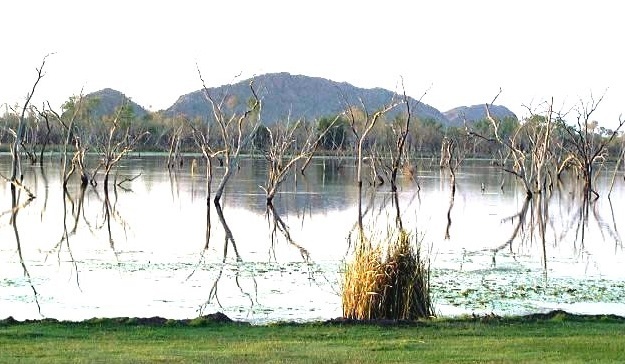 I do have one photo from our trip, taken at the caravan park on Lilly Creek Lagoon One day when we settle down I will have to transfer all those photos onto an external hard drive. After the slide show and reminiscing about our travels I drove 60 Klms back to North Lakes to collect Donnis after her shift then drove the 30 Klms back to Fairfield. We were home by 11.30pm. and on to Brisbane River. As the sun was setting we traced our steps home again. Today we took a bus into the city and all the way to New Farm on the Brisbane River. As the bus crossed a bridge and ready to turn into Adelaide Street we were stopped by a motorcycle Policeman. 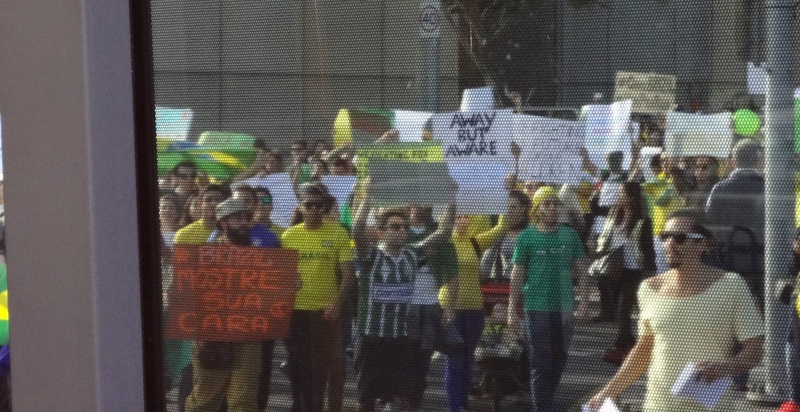 A protest rally supporting similar rallies in Brazil which have occurred this week. The long ling of mostly happy well behaved protesters marched past the bus. Our destination was to the Brisbane Powerhouse Museum. The museum is in the original umm err Powerhouse, hence its name. Much of the equipment has been retained within the building. It is a place for art and photo exhibits as well as a venue for rock groups and other performing artists. Today we came to see the 56th Annual World Press Photo Exhibit. It is also beside New Farm Park a popular family picnic park. 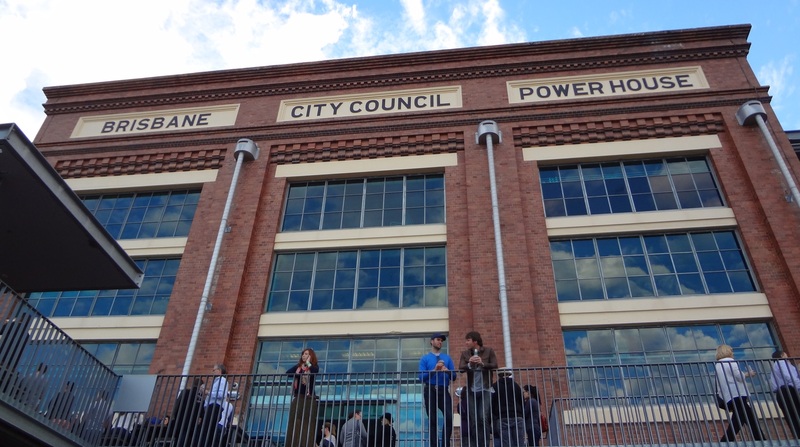 The Powerhouse is also a popular eating and drinking and socialising focal point. Busy, busy, busy. I started to take photos with the little camera but the @#$%^&* battery died after only a few photos. Grrr! http://brisbanepowerhouse.org/events/2013/06/01/world-press-photo/ . We also experienced a very loud rock band before catching a City Cat Ferry http://en.wikipedia.org/wiki/TransdevTSL_Brisbane_Ferries to SouthBank where we had a coffee before catching a bus back home. 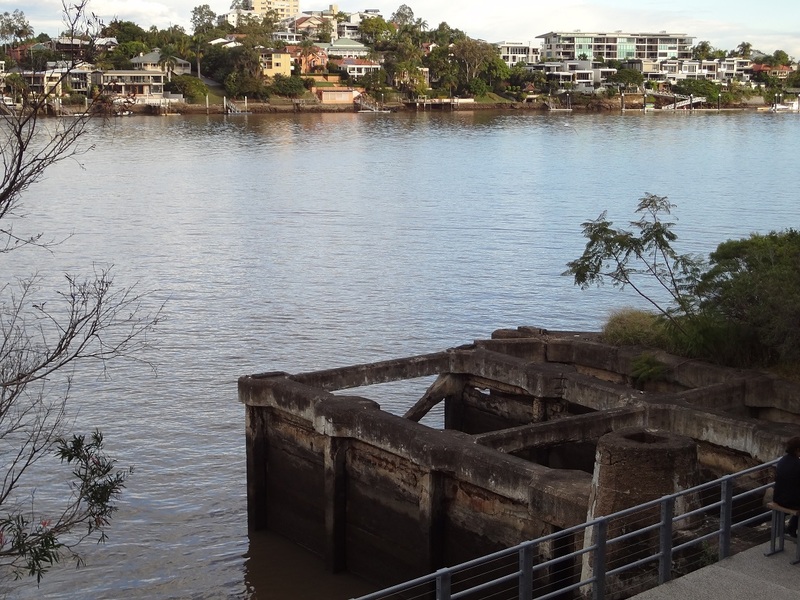 Looking south across Brisbane River from the Powerhouse.